Some of the homes I see now with most of my brother's residential projects are designed with modern architectural styles so totally different from the homes we used to see. Since there are modern innovations now on built-in kitchens and in some areas of the house the interior decorations are made in such same setup to harmonize with the modern stylish designs. Well it seems that it doesn't end up in the major areas of the house that even home staircase are gearing up to a modern style different from the traditional ones. 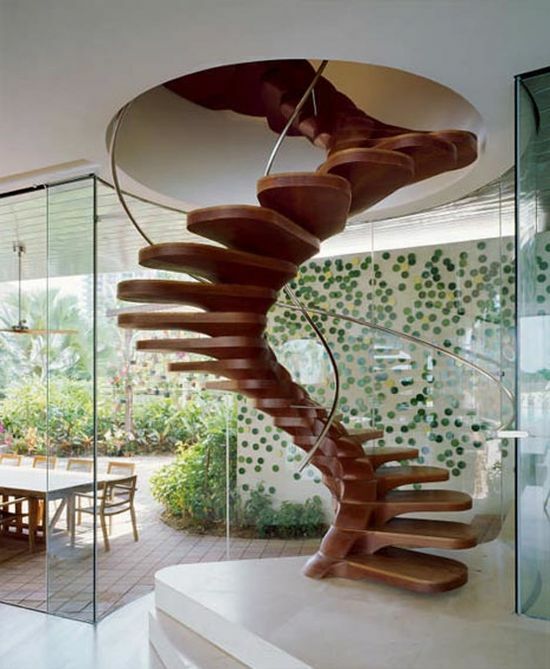 This spiral staircase made of high quality wood material would be mistaken for just a display only as it would not fit a home with kids because it's steep and revolving in such a dizzy style. The staircase is designed beautifully for the eyes only I suppose as this one would not be perfect for daily activities. Well this one would be perfect if the room upstairs is just an attic or a special room where activities is not always busy. I'm really thinking if it's for a home or for an office only but I like it.